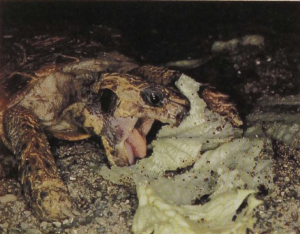 The medium-sized (shell length 8 inches) Pancake Tortoise occurs in a few areas of eastern Africa where it browses on the vegetation of the open, rocky plains. The legs are very long and the turtles are very active: not only are they able to right themselves quickly when placed on their backs, but they can also run across open areas at a speed almost twice that of ordinary tortoises. The shell feels soft because the bone normally underlying the carapace is only laid down as an outline, leaving large windows along the sides of the back, a unique condition among land turtles. When these animals were first discovered it was assumed that specimens with this many holes in the bony armor must be diseased; later books suggested, in error, that these tortoises could blow themselves up to resist being pulled out of the rocky cracks in which they rested at night. Actually, they depend upon speed rather than armor for escape from their predators, for the holes in the shell make for a lighter-weight animal that can run faster and longer.